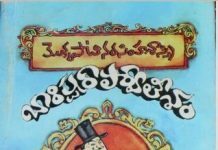 Gundamma Katha (English: Gundamma’s story) is a 1962 Indian Telugu-language comedy-drama film directed by Kamalakara Kameswara Rao and co-produced by B. Nagi Reddy and Aluri Chakrapani under their banner Vijaya Vauhini Studios. 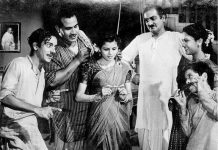 Partially inspired by William Shakespeare’s comedy The Taming of the Shrew, Gundamma Katha is the official remake of B. Vittalacharya’s Kannada film Mane Thumbida Hennu (1958). 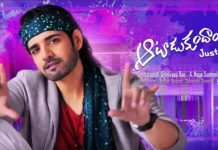 It is also the first remake by Vijaya Vauhini Studios. 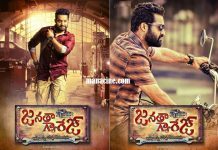 It features N. T. Rama Rao, Akkineni Nageswara Rao, Savitri, and Jamuna in the lead roles, and S. V. Ranga Rao, Suryakantam and Ramana Reddy in supporting roles. 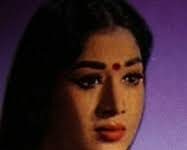 Gundamma is a rich widow who ill-treats her stepdaughter Lakshmi, a selfless person who is reduced to working as a maid. 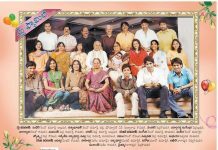 Gundamma has a daughter Saroja and a son Prabhakar. Prabhakar is in love with Saroja’s friend Padma. Gundamma has a half-brother Ghantaiah, a cunning but weak milk vendor. Ghantaiah wants Gundamma to marry off Saroja to his criminal son Bhoopati. To achieve this goal without the knowledge of Gundamma, he spoils every marriage proposal Saroja receives. Saroja’s arrogance and Lakshmi’s courteous attitude indirectly help Ghantaiah. Gundamma decides to marry off Lakshmi to a vagabond and Saroja to the son of Ramabhadraiah, a wealthy man living in a faraway town. 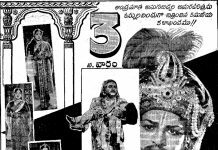 After observing the situations in Gundamma’s house with the help of Ghantaiah, Ramabhadraiah sends his elder son Anjaneya “Anji” Prasad to Gundamma’s house as a servant to get him married to Lakshmi. His younger son Raja meets Saroja through Padma, who is his cousin. Anji and Lakshmi get married, and Raja and Saroja fall in love. Ramabhadraiah writes a letter to Gundamma opposing the marriage of Raja and Saroja upon the former’s instructions, and Anji conducts their marriage against Ghantaiah’s wishes. Shortly afterwards, Prabhakar and Padma’s marriage is conducted. Raja acts as a drunkard and masquerades as Ramabhadraiah’s son seeking to gain Saroja’s wealth. A rift develops between Anji and Gundamma, and he leaves with Lakshmi. Anji, Raja and Ramabhadraiah reveal the truth to Lakshmi later. Raja storms out of Gundamma’s house and Saroja follows him; they join Ramabhadraiah’s house as gardeners and Raja ensures Saroja is unaware of their employer. In the process, Saroja’s character transforms from one of arrogance to one of a hardworking, courteous person. Gundamma is tortured by Padma’s ruthless, confidence-trickster aunt Durga. Bhoopati is released from jail and Ghantaiah asks Gundamma to give some money. Because of Gundamma’s arrogance, Prabhakar and Padma leave for Bangalore. Durga steals the money in the locker, accuses Gundamma of robbery and locks her in a room behind the house. Lakshmi and Anji visit Gundamma and become aware of her condition. Lakshmi and Gundamma coerce Durga and retrieve the money she stole. Bhoopati comes to Durga’s rescue but is defeated by Anji in a duel and is hospitalised. Saroja meets Ramabhadraiah, her employer, and walks out after a heated argument. She meets Lakshmi on the way and learns about Raja’s plans. 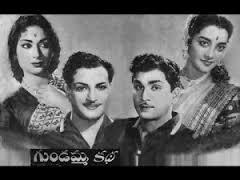 The film ends with Gundamma staying with her daughters in Ramabhadraiah’s house.